A white very light-weight powder (and bag of this material is like a bag of feathers). It is practically insoluble in water. This is not the same material as magnesium carbonate (magnesite). This material is very refractory, it does not decompose and give up its MgO to the glaze melt easily. 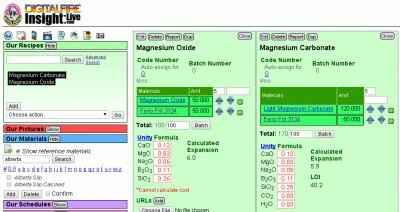 Magnesium carbonate is a good example of the need to consider mineralogy and material level physics in addition to chemical makeup when using ceramic chemistry to adjust and fix glazes. Two glazes may have the same calculated chemistry, but the one using the mag carg to source the MgO will not be melted as much. When added to glazes magnesium carbonate often mattes them, simply because it is refractory (it is useful at lower temperatures where making a good matte can be quite difficult). Even it is does decompose into the glaze melt, the MgO it supplies is a classic matting mechanism. Magnesium carbonate can also induce crawling because of the decreased mobility of the glaze melt and the exceedingly small particle size of the material increases shrinkage. This material has a very high Loss on Ignition, this could cause glaze surface issues. 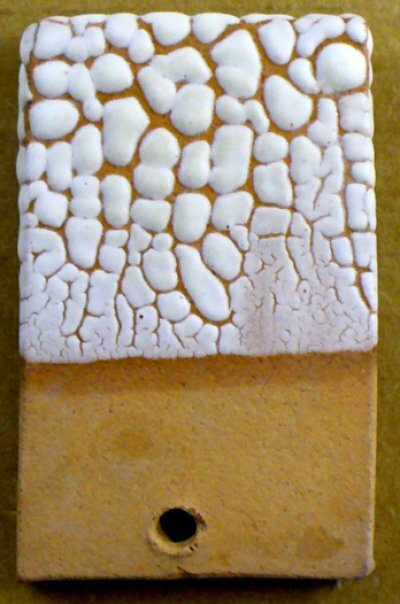 Dolomite and talc more readily release their MgO to the glaze melt for a higher temperature glazes. There is conflicting information on the decomposition temperature, sources report figures that vary from 350C to 650C. Thus it is possible that a host glaze could be already fluid before this material has finished gassing, trapping it within to create the glass equivalent of an Aero chocolate bar. If you use a large percentage of this in a glaze (for crawling for example), it may be wise to halt the kiln at 650C and soak during the fire up. Or do a test firing to 700C, cool the kiln quickly and check the melted state of the glaze. It is added (.12-.25%) to flocculate clay slurries, improving and stabilizing the set and suspension characteristics. It is used as a electrolyte in both ground and cover coat enamels. Light magnesium carbonate or hydromagnesite is made by precipitation from a boiled solution of magnesium sulfate and sodium carbonate. Light magnesium carbonate has been added to a low temperature terra cotta white glaze (about 10%). It induces crawling. It also mattes the glaze because it sources MgO. 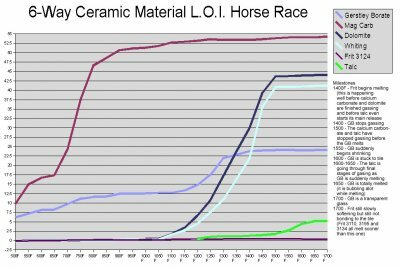 “Snakeskin” recipes to produce this effect can call for much higher percentages, but of course, fired properties (like color, gloss, thermal expansion) will be much more affected. A bag of magnesium carbonate beside a bag of feldspar. Although the former weighs 25 kg (vs. 22.7 kg for the feldspar), clearly it is a dramatically lighter (per volume unit) material. Lifting that bag of Mag Carb feels like lifting a pillow! 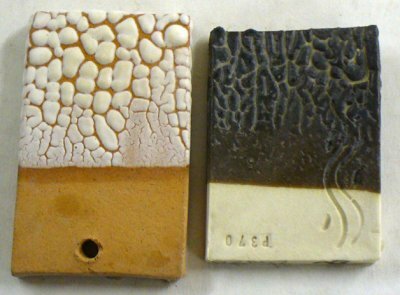 Example of two crawling glazes. Both have magnesium carbonate added to make this happen (around 10%). On the left at cone 04 on a terra cotta body, on the right at cone 6 on a porcelain. 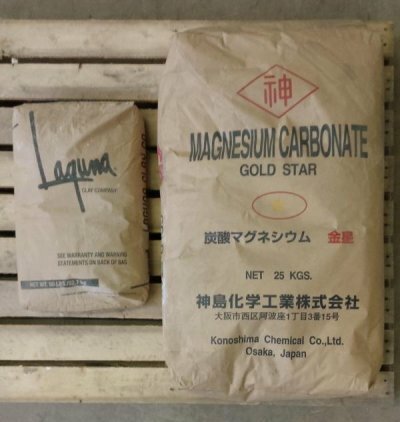 Magnesium carbonate also mattes glazes. (Suppliers - Manufacturer) [histaddcheckbox] Shanghai Yancui Import And Export Co., Ltd.